Born in Wiltshire in 1970 Anna trained at the Wimbledon School of Art and the Royal College of Art. Her artworks feature in many public and private collections, most notably in those of Robert & Susan Kasen Summer and the Royal photographer John Hedgecoe. Anna was one of the youngest winners of the prestigious Jerwood Drawing Prize [formerly the Cheltenham Prize]; her other awards include the Susan Kassan Summer Fellowship, the Daler Rowney Award, the Henderson & Parkinson Travel Award and the Stephenson Harwood Award. Anna’s work is also featured in the book An American Passion: The Susan Kasen Summer and Robert D. Summer Collection of Contemporary British Painting. Anna’s paintings are larger than life – often depicting women in boldly coloured interiors with a typical sized canvas measuring 1.5m x 1.2m. 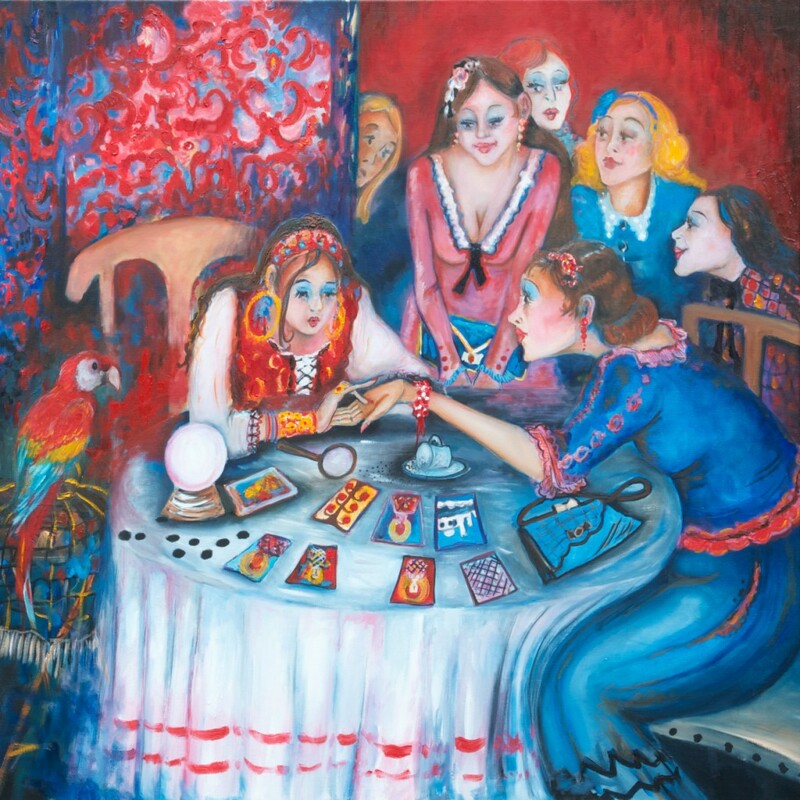 Painted from memory, recalling childhood tales filled with mysterious characters and playful possibilities, Anna paints an intimate world of whispers, giggles and long-lashed looks, where elements of caricature and burlesque theatricality give light relief to a serious representation of European matriarchy. Anna also specializes in charcoal drawing and in 1999 she won the Jerwood Drawing Prize. 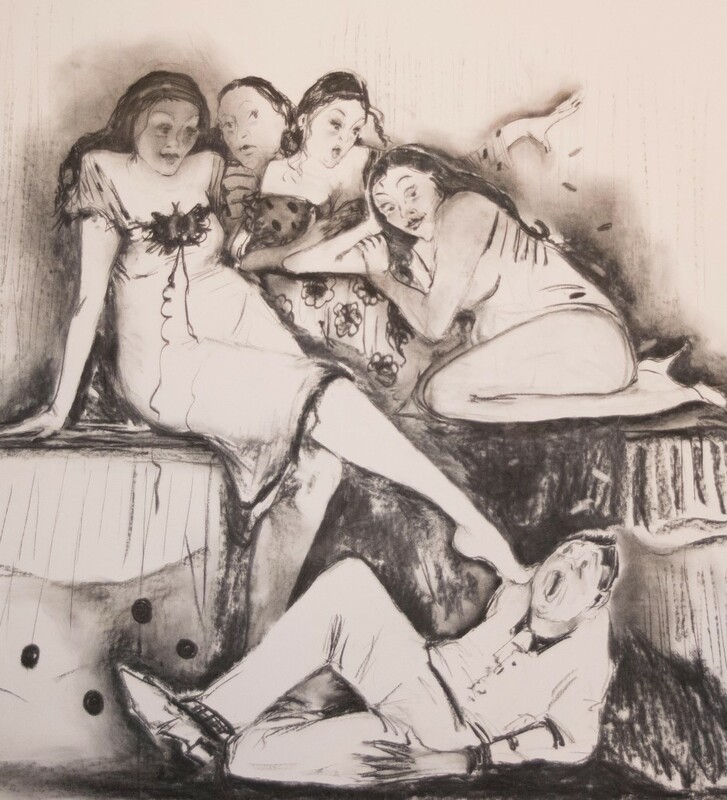 Anna’s drawing reflects her fascination with the silent film era when actors and actresses had to communicate expression and compensate visually for the lack of sound. In 1997 Anna Mazzotta held her first solo exhibition at Gallery 19 and we are delighted to have her exhibiting with us again, seventeen years later. 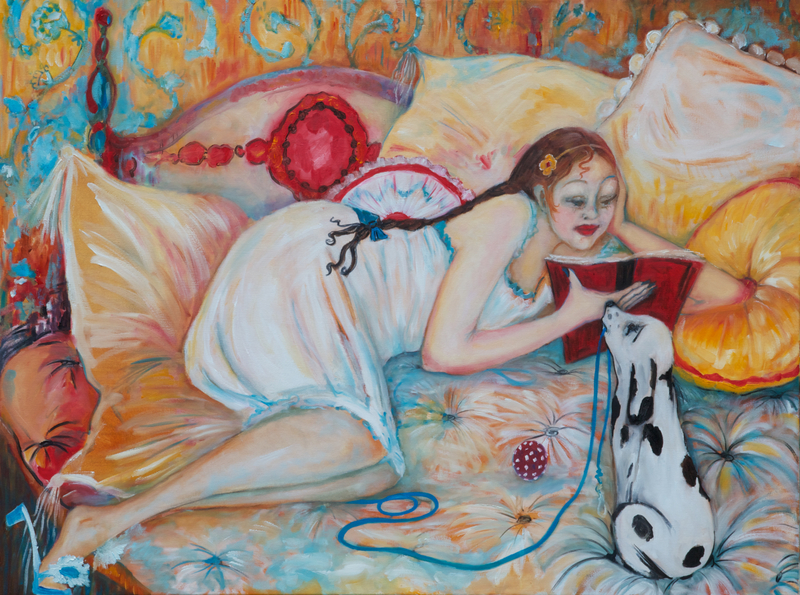 The art of Anna Mazzotta has been described as a cross between Beryl Cook and Paula Rego, with its own highly distinctive and provocative style. Welcome to the world of Anna Mazzotta.